The first experience of the Séon UV unit that anyone would have is of the case it is housed in. Having an enclosure that allows the man portable design in an industry standard form was essential in the development of Séon. 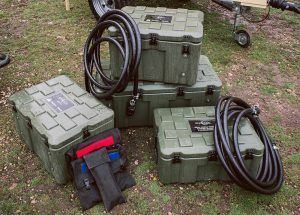 The Amazon Cases we use for Séon UV and Séon RO Seawolf also have NATO stock numbers; one benefit this gives easy identification for logistics when transporting. The science behind even a simple case is not insignificant. The materials used, the manufacturing process and the attention to detail are all vital. Rotational Moulding or Rotomoulding is not a new technology but offers a method of consistent wall thickness and strong outside corners; both essential when considering a life of a device that will be bumped and banged about in the back of a truck and need protection from all directions. The material used is virgin polyethylene. This is well suited to the rugged design requirements because any impacts or vibrations are absorbed by the material, protecting the contents and maintaining their integrity. Features such as the stainless steel hinges and low profile lid design to maximise the useable volume are all reasons we chose the Amazon case. So, although it is easy to overlook something as obvious as the case it comes in, the design of the Séon UV LED has always been focussed on ruggedness, reliability and the ability to withstand the rigours of a harsh environment.